The city (135,000 inhabitants) will have completed the modernisation of it’s trolleybus fleet with the delivery of further 15 trolleybuses, in 2009. By then, the whole fleet will be modern (younger than 10 years), efficient and environmentally friendly. The Trolleybus network of Solingen was build as a replacement for the outdated tramway system, in the 1950s. Large network extensions were made in the 1980s, and in 1993, when two new lines were put into operation. Today, trolleybuses run on 6, of altogether 21 bus lines in Solingen. They carry 65%, of the 26 million bus passengers travelling every year. This performance is accomplished by 40 trolleybuses running in everyday service, on 100 km electrified routes. In the mid of the 1990ies, the whole trolleybus system was up for discussion. This was due to a study saying that, trolleybuses compared to diesel buses, were too expensive. Denying this, another group of transport experts pointed out that the clear advantage of the trolleybus system like avoidance of direct emissions and the broad acceptance within the community, make the system worth keeping. Those experts also argued, that modern trolleybuses are up to 70% more efficient than the buses used at that time. Finally, in November 1996, the decision was made to preserve the trolleybus system and to purchase new trolleybuses. 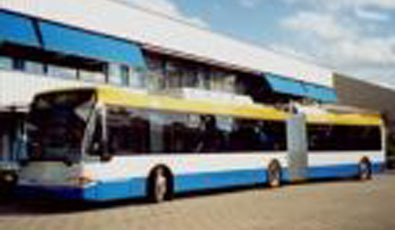 From 2001 to 2003 the Solingen public transport provider already put 35 new trolleybuses into service. For the delivery of the 15 new vehicles, the Swiss company Hess is responsible. Another company (Vossloh Kiepe) will be responsible for the electrical equipment of the buses. The delivery of the new vehicles will take place in 2009. But still this year two prototypes will be put into service, in order to check and improve the technical equipment of the whole delivery. The new buses are dedicated to run on line 683 from station Vohwinkel to Burg. On this line a special feature will be applied, the two condition motor. It enables the buses to run on short stretches without current, on diesel mode. This way the buses will be able to pass the underbridge in front of the Vohwinkel train station on diesel mode, which saves the expensive and complicated electrification of this stretch. Each of these buses will cost approximately 750,000 €, of which a big share is borne by the transport network Rhein-Ruhr. With 72 dB(A) a trolleybus emits only a fourth of the noise energy of a diesel bus (78 dB(A)). The emissions of PM10, SO2 and NO2 on the street are Zero. Overall emissions depend on how electric energy is generated. If electrical energy is produced from regenerative sources, than the amount of all pollutants and CO2 is lower compared to diesel buses. The efficient vehicles will save a lot of operation expenses and will increase economic benefits. Additionally the new low floor buses will be very attractive to the users of public transport in Solingen. Finally the avoidance of direct air pollution may contribute to Solingens abidance to the new EU-thresholds for PM10 (since 2005) and NO2 (from 2011).